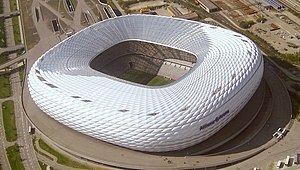 The Allianz Arena [ʔaˈli̯ant͡s ʔaˈʁeːna] is fitbaw stadium in Munich, Bavarie, Germany wi a 69,901 seatin capacity. Widely kent for it's exterior o inflatit ETFE plastic panels, it is the first stadium in the warld wi a full colour-chyngin colour exterior. Locatit at the northren edge o Munich's Schwabing-Freimann borough on the Fröttmaning Heath, it is the third lairgest arena in Germany behind Signal Iduna Park in Dortmund an the Olympiastadion in Berlin.